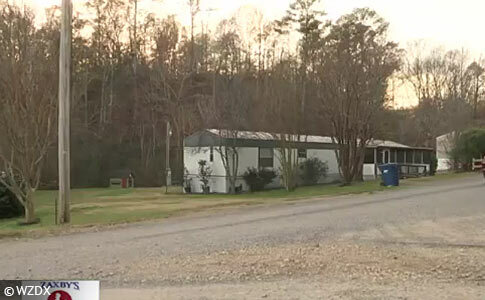 A pack of dogs killed one woman and seriously injured another near Guntersville. UPDATE 03/23/18: The owners of four pit bulls that killed a woman and seriously injured another last year have been charged with manslaughter and assault charges. 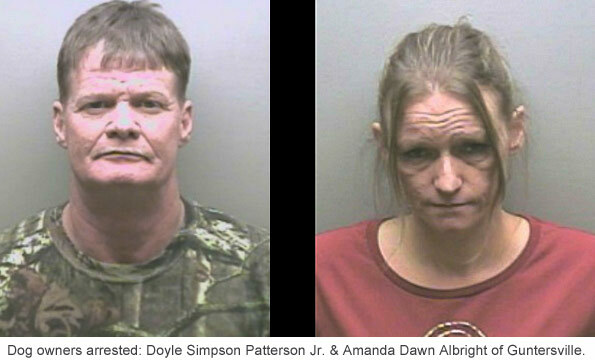 Doyle Simpson Patterson Jr., 47, and Amanda Dawn Albright, 40, both of Guntersville, were arrested after a grand jury indicted them on charges of manslaughter and second-degree assault. 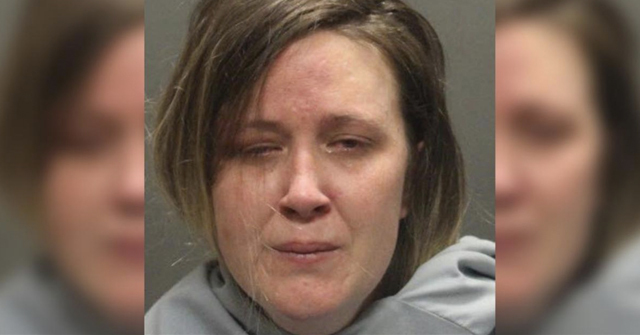 On November 29, the pack of dogs killed Doyle Patterson's sister, Tracy Cornelius, 46, and gravely injured another woman. Earlier reports said the dogs were known to be aggressive. Unidentified neighbors said the dogs had terrified people in the area for the past year. According to family members, Cornelius saw the dogs attacking Valeria Hinojosa walking along Jason Road and rushed out to help her. 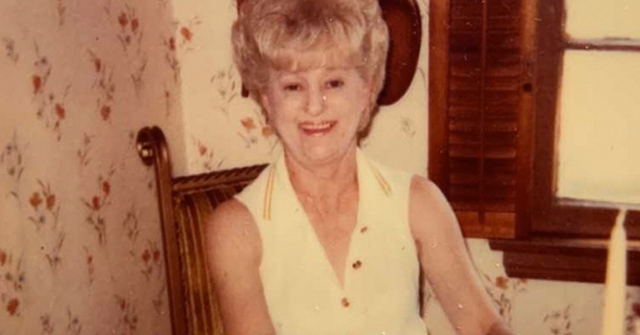 Cornelius lived two doors down from her brother, Doyle Patterson. 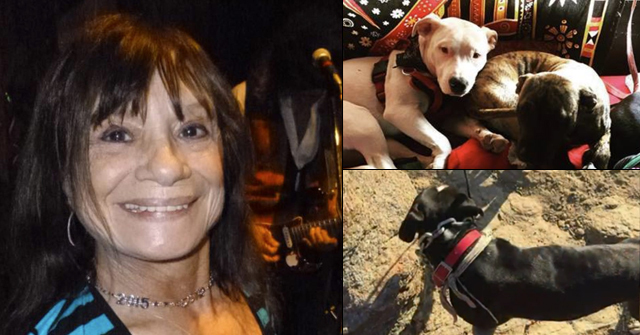 The pack of pit bulls attacked and killed Cornelius, attacked and killed her dog and seriously injured Hinojosa, who was airlifted to a hospital in Huntsville for treatment. Family members said Cornelius "died a hero trying to save someone else." All four dogs were put down. Tracy Cornelius was Patterson's sister, which Marshall County Sheriff Scott Walls says makes this case unusual. "This case is a little different, because of the type of charges. This is no direct intent. Negligence plays a big part of this case," Walls said. Walls says the mauling was horrific and Patterson and Albright were emotional during the arrest this morning. In an interview with the Gasden Times, Chief Deputy District Attorney Ed Kellett confirmed the earlier reports of the dogs' history of aggression. Kellett describes two cases the grand jury heard simultaneously. "You don’t expect to have one case like this in a career," he said. "To have two in one grand jury?" Kellett said the dog mauling case went to the grand jury because the owners failed to properly contain pits bull that were known to be aggressive, resulting in a fatal attack. The surviving victim in a vicious dog attack that killed Tracy Cornelius, 46, was released from the hospital after a weeklong stay. Family members said she was bitten 10 times by the pack dogs and underwent surgery due to her injuries. Cornelius' family members said that Valeria Hinojosa was out for a walk on Jason Road on November 29 when the four dogs viciously attacked her. When Cornelius came out of her home to help Hinojosa, the animals began attacking her. Cornelius' own dog rushed out to protect her, according to family members. Cornelius' dog died from injuries it suffered in the attack. The four attacking dogs, all pit bulls, mauled and killed Cornelius, mauled and killed her dog and injured Hinojosa so badly she had to be airlifted to a hospital in Huntsville. The owner of the attacking dogs, who lives two doors down from Cornelius, is related to her. The Marshall County Sheriff's Office said the dogs will likely be euthanized. The pursuit of criminal charges, if at all, likely hinges on Hinojosa and her family. Sheriff Scott Walls has already said the case is difficult because, "everybody is related and everybody knows everybody," but Hinojosa's family may feel different now. In all of this, it seems the dogs' owner was nowhere to be found during the attack. Cornelius lost her life trying to rescue Hinojosa. Authorities confiscated the four pit bulls plus three others that were on the owner's property. More details have been released about a pack of dogs attack that left one woman dead and another hospitalized Wednesday. Tracy Lynn Cornelius, 46-years old, was killed in the attack. The attack occurred on the property of Cornelius' relative, who lives two doors down from her on Jason Road. The surviving victim, Valeria Hinojosa, was Cornelius' friend. After the attack, seven pit bulls were confiscated or killed by authorities; all but one of the dogs belongs to Cornelius' relative. Four dogs were involved in the attack; the others were captured for precaution, Sheriff Scott Walls said. The white pit bull-mix mentioned in earlier news reports, which roamed the area for hours after the attack, was eventually shot and killed by law enforcement. Another dog died somehow at the scene before police and deputies arrived (possibly the victim of the dog fight reported earlier). At least one of the dogs involved in the attack was on a leash too, according to Sheriff Walls. No charges have been filed against the dogs' owner, who commenters claim is Cornelius' brother. In Marshall County there is no leash law ordinance or requirements for fencing. The case involving two dog attack victims will likely go to a grand jury in January to decide what charges, if any, the dogs' owner could face, Sheriff Walls said. The injuries suffered by Hinojosa appear to be very severe; a news report yesterday indicated that she was airlifted to a hospital in Huntsville. Guntersville, AL - A woman is dead and another is hospitalized with serious injuries after being attacked by four dogs Wednesday morning, Marshall County authorities said. Tracy Patterson Cornelius, 46, was killed by the dogs on Jason Road, just off Alabama 79 South at about 8:00 am, Sheriff Scott Walls stated in a new release. Authorities seized three of the dogs; the fourth dog, a white pit bull-mix, was captured by Marshall County Animal Control about seven hours later. Sheriff Walls said the women apparently knew the dogs. "Evidently, the ladies were trying to break up a fight between the dogs, and that’s how it got started," Walls said. "Of course, from there it just got out of hand quickly. Just a terrible situation," he said. Authorities said there were no previous reports involving these dogs. Sheriff's officials are conducting interviews with neighbors to learn more about the dogs' history. No other descriptive details were released about the four dogs. Subsequent news reports identified the surviving victim as Valeria Hinojosa. Her nephew, Hernan Torres, told WAFF that Hinojosa was out for her morning walk when the dogs attacked. Torres said the dogs were known to be aggressive and to chase people. Other unidentified neighbors told WAFF the dogs have terrified people in the area for at least the last year. 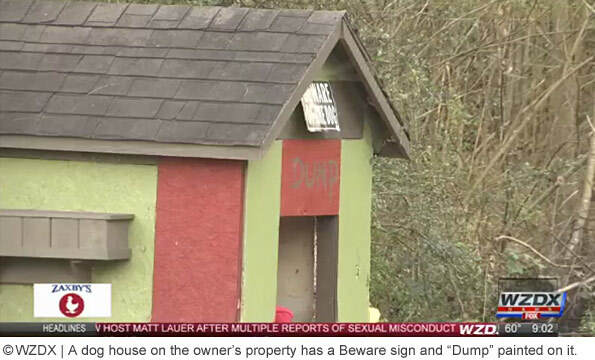 The WAFF video shows a ramshackle home, possibly belonging to the dogs' owner, which appears totally uninhabitable. Somehow I doubt to women out for a morning walk would try to break up a fight between pit bulls known ot be aggressive and terrifying to the community. Takeaway: Don't try to break up a dog fight. It's not worth the risk to your life. 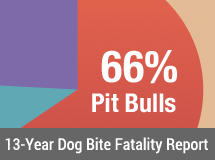 No one should be permitted to own seven dogs of ANY kind; and no one should be permitted to own more then ONE pit bull because no one can control more than ONE pit bull. If your dogs kill someone you MUST be charged. There is just no excuse for this. And there it is, the victim is related to the dogs' owner. Now that explains why she would get involved in this.